At least the pie was Fabulous!!! 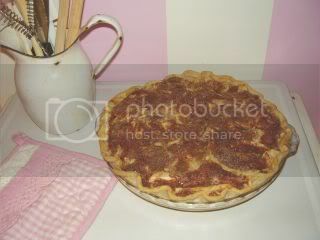 The Pie was SUPER DEELISH!! Very easy and fun to make....plus the whole apartment smelled of cinnamon! I will certainly be baking one for each side of the family this Thanksgiving!! We ate 2+ slices each..oh and of course had to kick it up with some whipped cream on the side...well no, not really "the side" more like......the top ..and the right side...and the left side! Loved it!! Thank you Alicia!! I hope to get this apt. organized today...and finish putting up all of our fall/Halloween decorations...I have boxes of bits all over the place...I just need to make decisions..I am baddd at that! Well...no..I am GREAT at it when it comes to other people's lives...like my sister..or my mother..or father..or brothers.....I can tell them what they should eat...wear...buy...listen to......but me...Oh mannn...ask Aaron or my sister....they want to kill me half the time!! Do not hand me a menu!! I will send the waiter/waitress away 3-4 times maybe! (now Aaron and Missy just order right away...and ignore me....I don't blame them!) I'm not sure what it is...I'd rather be told "tonight's special is meatloaf, mashed potatoes and gravy, corn, and a biscuit"...and I'd be the first to say ..I'll take it! !...but when I see lists of possibilities..I wanna just curl up and read decor mags or something.....(even though my stomach sounds like a sound bite from the weather channel..and I am about to die of hunger!) I usually tell myself .."pretend you are at a friends house...and their mom cooked ______". (fill in blank) That usually works for me. That really is how I finally decide on a meal. I have to imagine I had no choice ..and it is about the friends...the day...the conversation..the atmosphere! Oh boy! How'd I get on this topic? LOL!!!! Enough about how nuts I am! 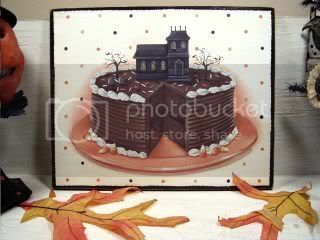 We finally finished our annual 11"x 14" limited edition holiday theme cake for Halloween 2006!! 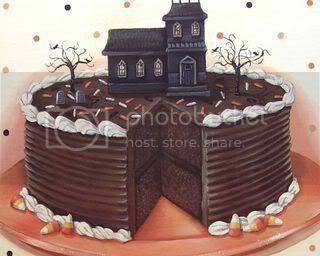 A rich devil's food layer cake featuring a piped white butter cream frosting border, combed chocolate icing, candy corn, festive sprinkles, and as a topper... a vintage inspired cardboard "Haunted House"! Accented by gnarly trees, and tombstones!! I am quite pleased with it! It is now listed on eBay! I want to thank all of your sweethearts for your kind kind words, and darling emails!! you truly make my day!! I am so happy I decided to start a blog! I have been such a HUGE fan of so many of your blogs for quite some time now!! So happy to be able to join in the fun!! Lots of Love! I felt the same way about the Lost season premiere. I actually, um fell asleep a few times during the show. At least you had yummy pie though.